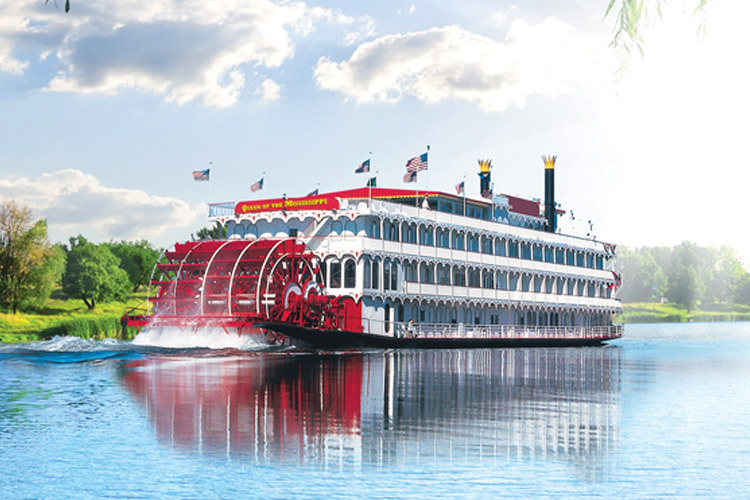 Cruise the Mississippi River from the banks of the Bayou to the shores of St. Louis. Your journey starts in the French Quarter, the oldest neighborhood in the vibrant city of New Orleans, brimming with art, music, and culture. Continue to Baton Rouge and Natchez, where you will experience the best in southern hospitality while touring historic homes and grand plantations. Enjoy a captivating lecture from the onboard Civil War historian on an exclusive tour of the Vicksburg National Military Park. While in Memphis, tour Graceland, once home to Elvis Presley, the king of Rock n’ Roll. Explore Paducah also known as “Quilt City,” and peruse its many museums and art galleries, before docking at St. Louis, home of The Gateway Arch, our nation’s tallest man-made monument. 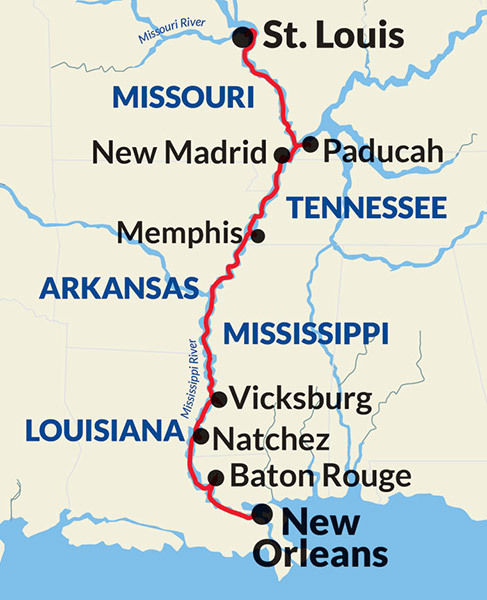 Settled in 1716, Natchez is rich in history and southern hospitality. Enjoy a guided exploration of this fascinating city which has retained its antebellum charm since its surrender during the Civil War. Visit Frogmore, a historic cotton plantation still in use today, or attend a special piano concert in the J. N. Stone House music room. U.S. history is alive in Vicksburg. This “Queen City of the Bluff” offers plenty of opportunities to step back in time. Civil War battlefields, century old churches, cotton fields, and restored train depots are just a few of the many intriguing landmarks that await your visit. Marvel in the beautiful antebellum-style homes and learn about Vicksburg’s rich history as displayed on the riverfront murals. 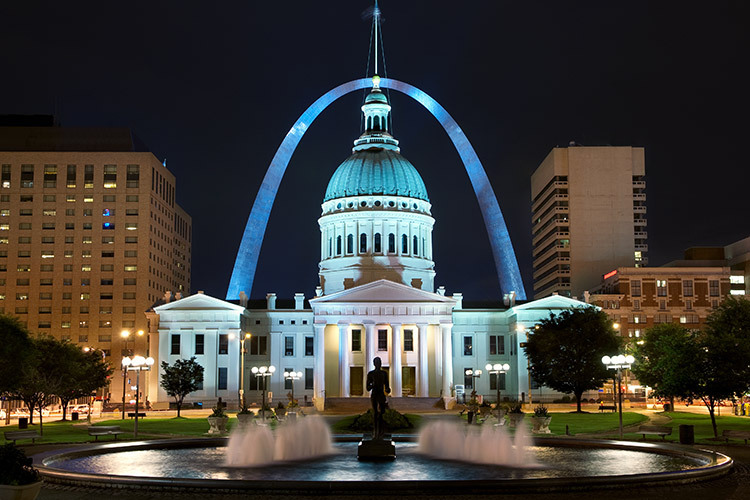 As you make your way from historic New Orleans to St. Louis, revel in the sights and sounds of the spectacular Mississippi River. Spend time chatting with other passengers in the lounges or enjoy a cocktail on your private balcony. Residing at the confluence of the Tennessee River and the Ohio River, Paducah will make you feel as if you stepped back in time. As you walk the streets of this Chickasaw village site, discover Paducah’s rich history. View the Wall-to-Wall Mural Program, a collection of over 50 murals that covers a number of subjects including Native American history, the Civil War, and area landmarks such as the Old Carnegie Library. Led by our expert guide, tour this enchanting city with a stop National Quilt Museum. Alternative dates are available for 2019 & 2020 - Please call 0800 810 8220 for details! Terms and conditions apply, all offers are subject to availability and operator booking conditions. All savings are included in the fares shown and were correct at time of print, but are subject to change. Prices are per person based on two passengers sharing the lead in grade stateroom unless otherwise stated. We charge a one-off small £20 booking fee. That’s it - nothing more and no add ons when you pay the balance. E&OE. ABTA P6710.